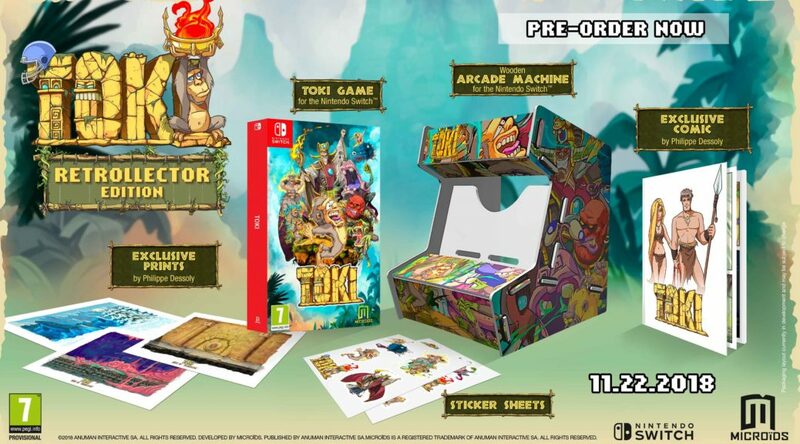 Microids has announced Toki: Retrollector Edition, a special edition of Toki for Nintendo Switch launching on November 22, 2018. Here’s what the Retrollector Edition contains: a copy of the game, wooden arcade machine for Nintendo Switch, sticker sheets, exclusive comic by Philippe Dessoly, and exclusive prints by Philippe Dessoly. Toki makes his great return on Nintendo Switch with a remake featuring all-new graphics and re-orchestrated music. The game will be available on November 22nd, 2018. Initially released in 1989 on arcade machines, this cult 2D action/platform game marked a whole generation of players with its simian main character and a level of difficulty typical of games at the time.